Half Dome and waterfalls from Glacier Point. This was a very bright scene during the middle of the day. But using exposure compensation helped saturate the colors and avoid a washed-out photo. 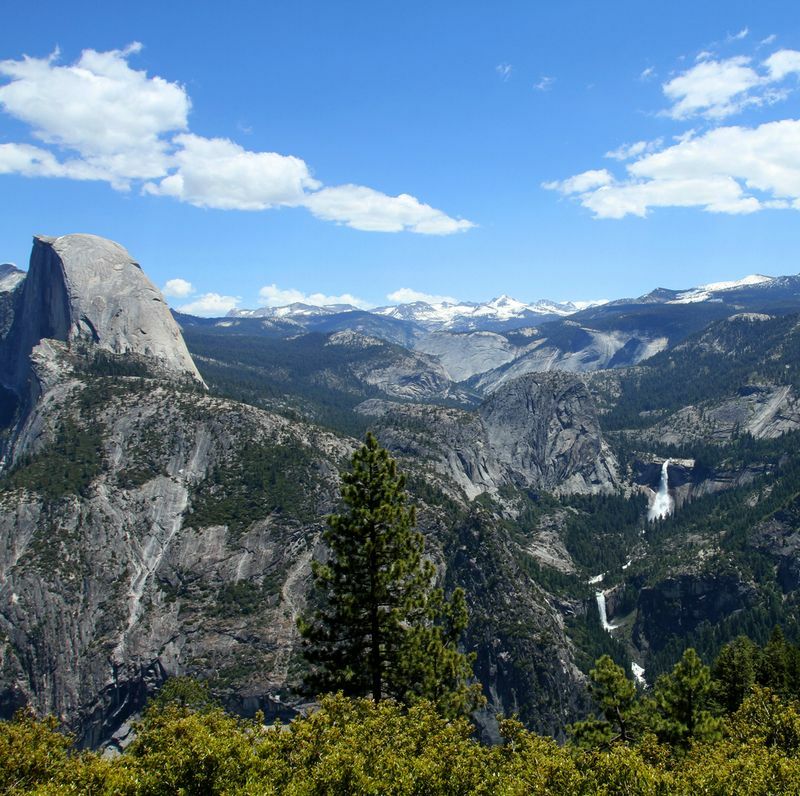 I stood in the shadow of Half Dome reading the Yosemite calendar of events when a man with a long gray beard approached me. “See anything good?” he asked. And, no surprise, I did. After all, I’d taken the Canon photography-in-the parks hands-on workshop that morning. Also free. What’s more, there’s plenty of time left this summer for you to take a workshop as well. For the fifth consecutive year, Canon and the National Parks are offering Canon in the Parks, free digital photography workshops and photo presentations in a series of National Parks. The workshops move from Yosemite (June 7-28), to the Grand Canyon (July 4-July 24), to Jackson Hole (July 29-30), to Yellowstone (August 1-7), to Acadia (August 16-24). (For a complete schedule, visit www.usa.canon.com/parks.) They are also testing out video workshops in two locations, Acadia and Jackson Hole. 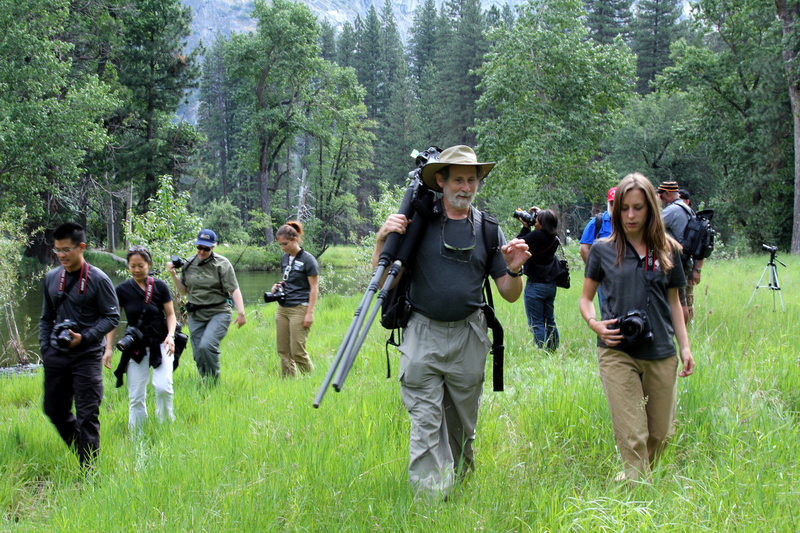 Lewis Kemper leads a class in Yosemite. Skilled photo professionals lead all the classes, but I was especially lucky to experience one with Canon “Explorer of Light” Lewis Kemper, who lived in Yosemite for 11 years and worked with some photo greats, such as — are you ready?– Ansel Adams. 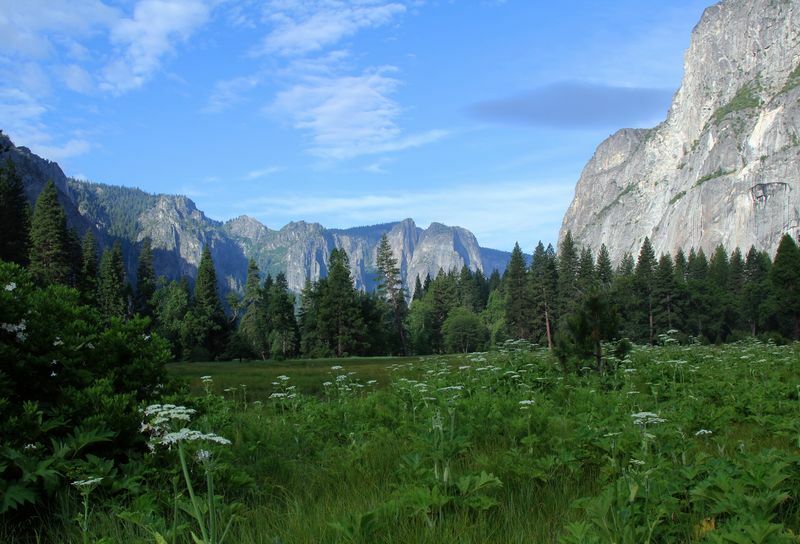 Since Lewis is also the author of the Photographing Yosemite Digital Field Guide, it’s hard to imagine a better teacher. The times of the workshops vary by location, but mine was at 8:30 a.m. Later sleepers could take one at 11:30 or 3:00. You don’t have to pre-register, but you might want to get there early, with credit card and driver’s license in hand, so that you can borrow (also for free) some Canon photo equipment. They offered a variety of cameras, from the $799 Canon Rebel T2i to the $1,699 Canon Eos 7D, to the $2,499 Eos 5D Mark II. As I clutched a 7D, I spotted one woman stroking the $1,799 100-400 lens she had always lusted after and was finally getting to try. Canon also loaned out CF and SD cards for the cameras, courtesy of Lexar. The range of students was impressive, from a man in his 80s to a 17-year-old girl whose mother had shipped out to Afghanistan the day before. We split up into two groups: newbies and more experienced photographers. Lewis took the latter over to a spot near Yosemite Falls where he gave a short talk, full of tips (e.g., how to create a custom white balance, how to overcome contrasty situations with High Dynamic Range techniques, how to use the new high ISO settings to triangulate with aperture and shutter speed to make your preferred manual settings work). Cow parsnips in Cook’s Meadow. After a couple of hours of walking and learning, with four or five Canon guides also providing tips and assistance (making for a very nice teacher-student ratio), we headed back to the red Canon tent to turn in our equipment. But it wasn’t over yet. Canon experts also printed out our favorite pictures. Midnight Moonbow at Yosemite Falls.This has a 30-second exposure, which was necessary late at night. The moonbow is the small rainbow that appears by the falls. The format for the evening presentations is completely different. That night, in the Curry Village outdoor amphitheater, Lewis gave more photo tips and showed us slides of his work to illustrate each one. He talked about different kinds of light and how to use them to advantage (e.g., diffuse light is good for close-ups and flower images while back light is a great opportunity for silhouettes). He went on to talk about color (e.g., using warm colors with a cool accent or underexposing to increase color saturation) before turning to other subjects, such as framing, the rule of thirds, using repeated patterns, and much, much more. His slides were a perfect illustration of each one. He closed out the evening with an astounding slide show of Yosemite through the seasons. Its beauty briefly threw me into despair (how did he do that?) before making me resolve to work much harder on my photography. 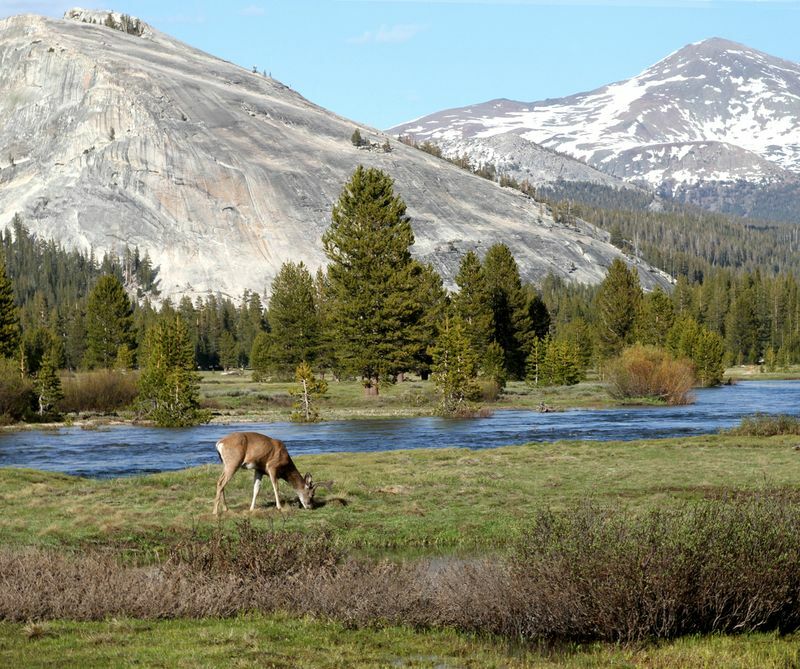 Deer at Tuolumne Meadows .To keep the photo sharp from foreground to background, I shot at F13. The deer is positioned off-center, more or less where the gridlines would cross, using the rule of thirds. 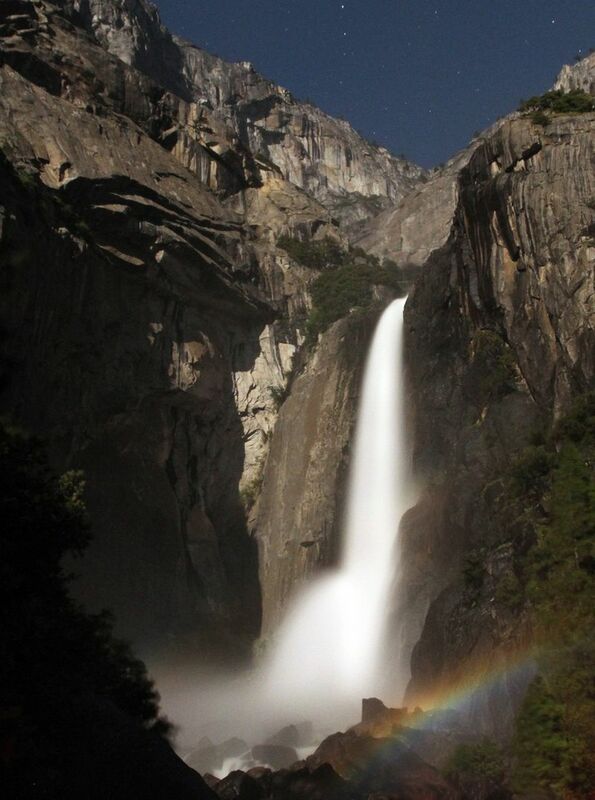 And I, like probably every other person in the amphitheater, tried to do just that, taking his tips out to Glacier Point, Tunnel View, Hetch Hetchy, Tuolumne Meadows and even to Yosemite Falls at night where I was able to capture the elusive moonbow. Thank you, Lewis. Thank you, Canon. I’ll be back next year. Photography In The Parks Photo Contest, which ends on September 30, 2010.
images to friends and family. OhRanger.com/PhotoContest. To submit your photo, visit photographyintheparks.com. What beautiful photography. Truly captures the essence!